“salad” of marshmallow, cream cheese, whipped cream and cookies. But really, is this woman foolish or not? She apparently didn’t save room for Plum Pudding with Hard Sauce! Who Doesn’t Like Brussels Sprouts Now? Scientists in the UK linked 1,000 brussels sprouts together to make a vegetable battery, which is powering the lights of a tree on London’s South Bank. 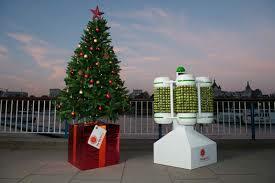 The battery was created by a team from “The Big Bang UK Young Scientists and Engineers Fair”. Copper and zinc electrodes have been placed between the sprouts, creating a small reaction. That’s a Serious Yule Log Cake! In 2000, in Edmonton, Alberta, Canada, Northlands Spectrum created the world’s largest log cake, which measured 72 feet long, 18 inches wide and 13 inches high. 3,500 people shared in the cake and the remainder was sent to the local food bank. That’s not the turkey making that sound, it’s the noise you make when you rip into an 86 pound turkey for Christmas dinner. 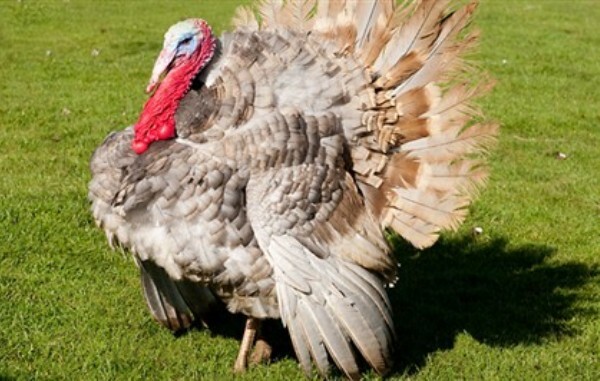 “Tyson”, according to the Guinness World Records, has the notoriety of being the heaviest turkey. “Tyson”, who holds the Guinness World Record for the heaviest turkey, at 86 pounds. He was auctioned for charity and fetched a pretty decent price of 4,400 UK pounds! That’s about 51 pounds per pound! The largest cooked ham (2010) weighed in at 182.87 pounds, in Vicenza, Italy. In Managua, Nicaragua, a giant fruitcake, baked to help children’s charities stretched 1,640 feet long and weighed 31,865 pounds. The cake consisted of 60,000 eggs, nearly 100 pounds of both flour and sugar, 320 tubs of margarine, 75 buckets of candied fruit and 30 buckets of caramel. It also had unknown quantities of guava and pineapple jam. World’s Largest Fruitcake, Managua, Nicaragua. 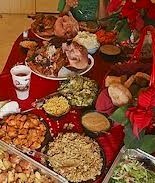 More trivia: there is still an opening for enterprising holiday cooks this year to become the Guinness World Record title holder for the largest bowl of gravy. Go for it! This entry was posted in Cookbooks, Cooking, Cooking and Social History, Eating, Guinness World Records, Uncategorized and tagged Brussel Sprouts, Christmas, cookbooks, Cooking, Donna Simpson, Food and Science, Guinness World Record, London. Bookmark the permalink.